Homelessness, family demands and cancer did not stop this grad from realizing her dream of a college degree. Three different types of cancer, homelessness and raising children, including four who aren’t her own, didn’t prevent Geneva Lawton from attaining a college degree. 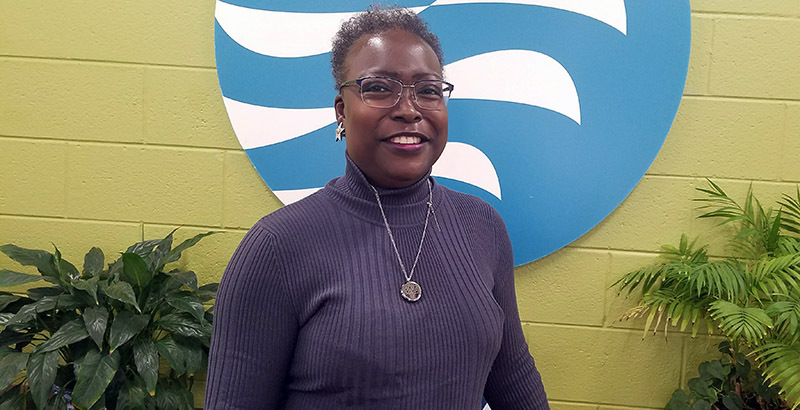 It took 17 years, but more than two dozen friends and family will watch her cross the stage at Tidewater Community College’s 65th Commencement Exercises on Dec. 18 at the Ted Constant Convocation Center. Lawton, 50, will graduate with an Associate of Science in General Studies. She plans to enroll at Norfolk State University to pursue a bachelor’s in social work. “This is a dream! I had a rough upbringing and was told I wouldn’t amount to anything. I decided early on that I was going to get a degree and do something with my life,” Lawton said. Lawton first enrolled at TCC in 2000, but was sidetracked by health issues and family demands. The family struggled financially and faced homelessness. They applied and received a Habitat for Humanity house and went to work building homes for others in need. When Lawton’s cancer kept her inside, the group gave her a job in the office and eventually provided a helping hand to home ownership. All six have attempted college and her own children, Carolyn and Maxie, and niece Shanice hold degrees. Lawton has had a front-row seat for watching TCC grow over almost two decades. “I love the new buildings and the student centers, but one thing that never changes is that the people are committed to seeing students succeed. You can feel them backing you,” she said. Lawton holds a 3.5 GPA and is a member of Phi Theta Kappa, the honor society for two-year colleges. She discovered her love of math at TCC and credits staffer Kendra Brown with helping her succeed in college algebra. She also recognizes professors Azam Tabrizi, Jeffrey Stewart and Jimmy Peterson with providing extra support.